Create a patio area or outdoor living space that is just as comfortable as your living room with elegant and inviting chaise lounge cushions. 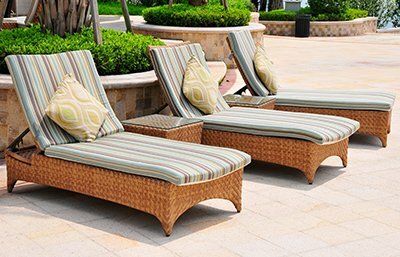 Whether you need chaise seat pads, two piece seat and back cushions, or a one piece custom chaise cushion, Cushion.com can custom make the perfect cushion for your wicker, wood, aluminum or wrought iron chaise lounge. Our chaise cushions and chaise pads are made according to your specifications and are crafted of weather-resistant fabrics that are designed to withstand years of normal exposure to sunlight, rain and resist fading, staining and mildew. Select the style that best fits your chaise from the options below and proceed to the next steps.